When Steve and I planned our great adventure to South America, we knew we needed a data plan for our phones. We decided to use Project Fi from Google for $10/GB. I’ve written up the experience in a couple of blog posts and talked about it on the show ( podfeet.com/…. Project Fi gave us inexpensive and fast Internet access on our trip, but I had to buy an Android phone in order to initialize our Project Fi SIM cards. For most people that would be kind of a drag, but it gave me an excuse to play with my first Android phone. I bought a Google Nexus 7 tablet many years ago but haven’t played with Android since. The phone I chose to buy was the lowest cost model you could get and still use it to set up Google’s Project Fi. 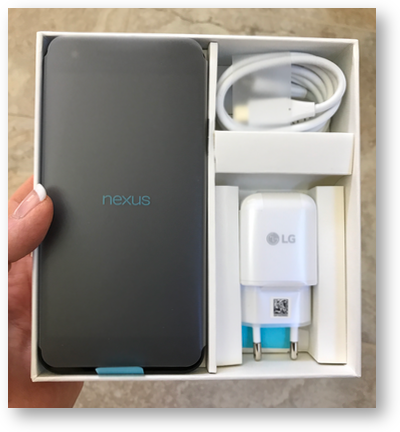 I bought an unlocked, European LG Nexus 5X. I paid $300 for it on Amazon directly from LG. If you’ve been reading or listening for any length of time, you know I have an EVER so slight Apple bias. For that reason, you should not take my review of this phone as a definitive and unbiased review. But I have a spoiler for you, I kinda like this phone! 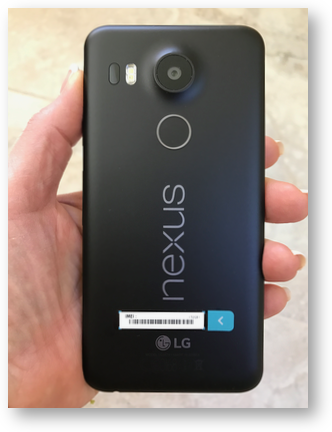 The Nexus 5X has 32GB of memory, it’s “carbon black” with a matte finish so the case doesn’t show fingerprints at all. It’s got a 5.2″ screen with 1080×1920 resolution. That puts the screen size pretty close to halfway between the iPhone 7 and 7 Plus. It’s physical dimensions are right in between the two iPhones as well, with the thickness just about the same as the iPhones. Interestingly, the Nexus 5X weighs less than the smaller iPhone. The back is plastic, which I’m sure contributes to its light weight. It doesn’t feel at all cheap, though. The screen resolution is exactly the same as the iPhone 7 Plus (on a smaller device) but it’s bright and pleasing to the eye. I don’t want to keep comparing to the iPhones, since the lowest end iPhone 7 is more than twice as expensive but I wanted the iPhone users amongst us to have a feel for what it’s like to hold in your hand. If you care about speeds and feeds, the Nexus 5X has a Qualcomm Snapdragon 1.8GHz quad-core dual processor running inside. From listening to other podcasts, I’ve heard that quad-core is important for speed with Android. Probably the first thing to surprise me was how well the fingerprint sensor works on the Nexus 5X, especially since it’s on the back of the phone. I know there are rumors out there about the next iPhone having a bezel-less screen and possible problems with making a fake home button/fingerprint sensor built into the screen so Apple might have to put it on the back. People are losing their ever-loving minds about that, but it doesn’t worry me at all. I think, if it does happen, we’ll get used to the location in a short while and never look back. Most importantly, the fingerprint sensor was just as easy to set up on the Nexus 5X as it was on my iPhone, and it opens the phone just as reliably. Far harder for me to get used to is how to turn the Nexus 5X on. The power button on the right side turns on the screen instantly but I always forget that’s where it is. I’m sure if it was my daily driver I’d get used to that. The good news is that picking the phone up awakens the screen too, so I’m not baffled for long! The camera on the back has a pretty big bulge, but since the iPhones have it now too, I’m contractually obligated not to mock it for that. If you’ve ever considered getting an Android phone, I’m sure you heard Bart in the back of your brain yelling, “Don’t do it!! !” But if you listen to that voice carefully, you also hear him saying, “Unless you buy it directly from Google.” The Nexus 5X made by LG is a pure Google phone, so it gets all of the security updates as fast as they come out. In fact, while writing up this review, the Nexus 5X informed me that I had an update to install. Just like with iOS, it always confuses me when I get a notification on screen that says to tap it, but it doesn’t open because the phone is locked, so I unlock the phone and the OS doesn’t take me to the update! I really don’t understand why iOS and Android behave that way. After unlocking the phone, I fiddled around looking for the update in the System settings, accidentally dragged down from the top once, and there was the update yet again asking to be tapped. As soon as I did, it asked me to download and then restart to install. The good news is I learned to pull down to find notifications. I know, that’s where they are on iOS too so I should have thought of that! One of the great things about Android is that once you give your life away to Google, setting up a new device is really easy. I gave it my Google logins, and my contacts, calendar and mail were all there. I can’t speak for all Android devices, but the Nexus 5X gave me a ton of app updates when I first logged into it. Makes sense because of the lag from when it’s provisioned until it’s opened by a user. Typing on the Nexus 5X is dreamy. They’ve got haptic feedback that I really find pleasing. I think if I left it on all the time though, it would start to bother those around me because it does make a fair bit of sound. Predictive text is useful, and editing of the inevitable typos is intuitive as well. I’m so new to the operating system of Android that I can’t possibly give it a run for its money. I did discover after installing my favorite messaging app, Telegram, that I could add Telegram contacts to my home screen. You can’t do that on an iPhone. I added Steve Sheridan and Steven Goetz (only Steves for some reason) to my home screen and I was able to tap their names to begin or continue a conversation. Steven Goetz and I have chatted quite a bit this way and he was none the wiser that I was using Android. The camera on the Nexus 5X is nothing to write home about. It’s a 12MP camera but that isn’t really a good measure of quality these days. The optics and the processing on the phone make much more of a difference in image quality. I wanted to do some photo tests on the Nexus 5X and compare them (unfairly) to the iPhone 7 Plus. But that’s where things started to go downhill. The Nexus 5X uses USB-C, which meant I was able to plug it directly into my new MacBook Pro without a dongle. Yay! I immediately got a charging error from the Mac saying that USB Accessories were disabled and I should unplug the accessory using too much power in order to enable them. The only thing I can figure is that the fast charging available in the Nexus phone was more than the Mac was programmed to provide. In spite of this error message, my other USB devices continued to work, and the Nexus 5X charged anyway. The next adventure was trying to figure out how to get photos off of the camera. I opened Image Capture on the Mac on a dare, but the phone wasn’t visible as a connected device. I went to the Googles and found a Mac app called Android File Transfer app that allows you to navigate the file system of Android phones. I was pretty excited about being able to see the file system – don’t you wish you could that on the iPhone? When I launched Android File Transfer, I got an error telling me to unlock my phone, but my phone WAS unlocked. On some devices, like the Zoom H2 recorder, I know you have to tell the device to act as a USB mass storage device. I hunted around in the Android settings but found no way to control USB. I hunted around in the Googles again and they said I had to enable the ability to transfer photos, just as I suspected, but several sites said I had to tap on the battery symbol on the top of the screen to get to the right menu. That made no sense, and I never could get that to work. Eventually after clearing some other notifications, I discovered that if I pulled down from the top, one of the options talked about USB settings. From there I was given five options. Charge this device, supply power to some other device (which is actually really really cool. My iPad drains the Kangaroo PC of power when I try to use it as a display so I wish iOS had this feature! Anyway, I digress.) Next on the list was Transfer files, then Transfer photos (PTP). 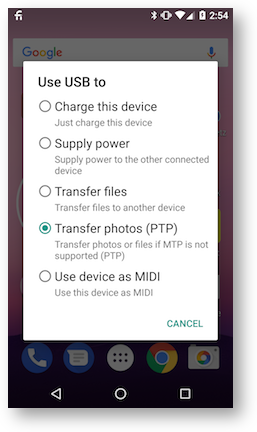 This option says to use it to transfer photos or files if MTP is not supported, whatever the heck MTP is. Finally I could choose to use this device as MIDI interface. The first option I chose was Transfer files, and the Android File Transfer app finally let me see the file structure of the phone. That was cool and there was a photos folder, but guess what? No photos! I tried dragging an image into the photos folder, and it transferred into the phone. 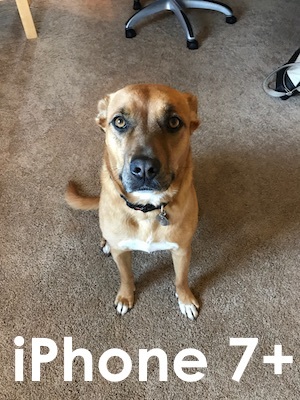 I opened up photos on the phone and was met with the Google Photos app begging me to share my photos in the cloud. 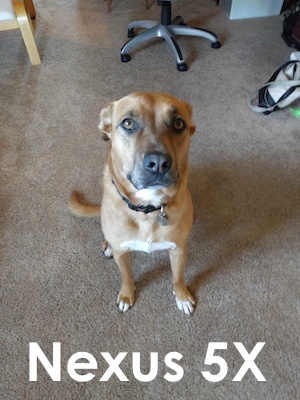 No, not begging, practically demanding. I defiantly chose not to do that. From there it got confusing (like it wasn’t already confusing). In Photos, there’s an album called Camera, and one called Pictures. All of the photos I’d taken with the camera were in the Camera album, and the one I’d uploaded from my Mac was in Pictures. Ok…that’s a weird distinction. And I’ve successfully done the opposite of what I wanted to do. I still haven’t gotten the pictures off of the phone and onto my Mac. Back to the USB menu. This time I chose Transfer Photos, which might make more sense. But choosing that option immediately quit Android File Transfer app, and I couldn’t restart it. Back to the Googles yet again. This time I discovered that if you enable PTP, the Transfer Photos protocol, now Image Capture can see the images (and so can Apple Photos). Wow. That was a LOT harder than it should have been! I can see why people agree to give their photos to Google’s cloud service. You might expect me to do an exhaustive test of the camera on the Nexus 5X, in different lighting conditions, testing all modes, changing subjects, but for this review I’m only going to talk about one photo of Tesla. It’s demonstrative of my observations of other subjects. The Nexus 5X camera is soft, lacks detail, has poor color saturation and will be a disappointment if you’ve ever had a good camera in a phone. It’s important to keep in mind that the iPhone 7 Plus costs more than twice the price of the Nexus 5X and is the flagship phone of the Apple line, so comparing the images might not be fair. But the Nexus 5X camera’s images still don’t look good. As much trouble as I had pulling photos from the Nexus 5X, I don’t want you to think that the other settings are as hard. I was able to easily figure out things like WiFi and cellular network connections. I haven’t by any means given this phone or Android an exhaustive run-through yet, but I could see using the Nexus 5X for a week or so if my iPhone was in the shop and not hating the experience. One last comment. When we went to see Lindsay before we left on our big trip, I tried to show her my new Android phone and she promptly pushed it away and said, “Ewwww!” I clearly raised her right.